More than 30% of patients who visit a doctor each year have respiratory complaints. These can range from minor infections (such as the common cold) to chronic obstructive conditions (such as asthma). This helpful book looks at the respiratory problems that nursing and healthcare professionals are most likely to encounter in clinical practice. Beginning with an overview of the respiratory system, the author then discusses history taking, and the physical assessment and secondary tests needed to assess a patient with an undiagnosed respiratory condition. This is followed by chapters on the aetiology, assessment and management of specific acute and chronic conditions, as well as a chapter on the pharmacology of respiratory disease. Finally, the author looks at intermediate, home-based and end of life care. 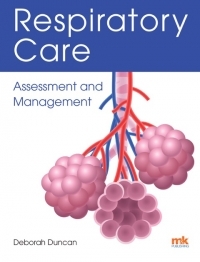 Featuring boxes, tables, diagrams, reader activities, a list of abbreviations and a full glossary, this book offers a holistic and practical approach to caring for a patient with a respiratory disease.